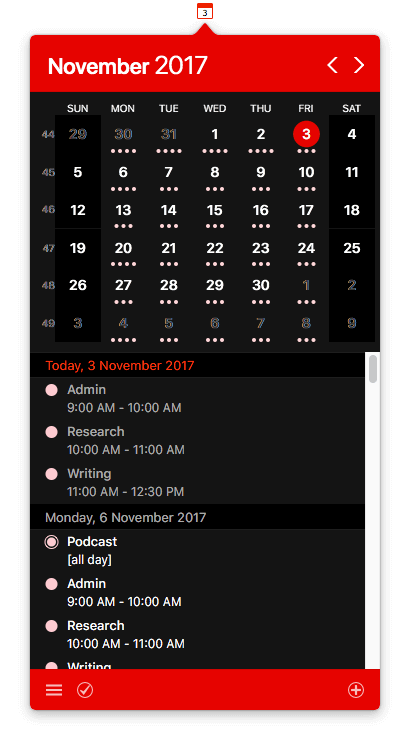 I really like Fantastical. It seems like magic the first time you try it. It also ruins you for data input. Once you have tried natural language capture there is no going back. I’m not being silly, I honestly get lost when I try to enter calendar events in the native Apple Calendar app. Or any app that doesn’t have natural language parsing. Flexibits natural language parsing is about as good as it gets, which is why I tend to recommend their apps. But, if you are looking for a Fantastical alternative for macOS and iOS, read on. Most of my calendar interaction is on iOS. Between the iPhone and Apple Watch, being hopelessly forgetful isn’t the problem it once was. Fantastical’s capture abilities have kept me from using any app I consider to have a nicer user interface. I’m thinking of Timepage in particular, a wonderfully designed app that doesn’t support natural language parsing. Although, that said, one of the benefits of Apple’s Eventkit is that you can use one app for input, another for interactions, and another for notifications. If you want to go crazy. But, that is a story for another time. As far as macOS apps go, Fantastical is not cheap. Don’t get me wrong, it is a fine piece of software, and handy as hell. Just type your events into it like you would speak them, and watch it do its magic. But here’s the rub, it cost me a fiver on my iPhone, and only twice that on my iPad. It will set you back five times those apps put together to complete the trilogy. 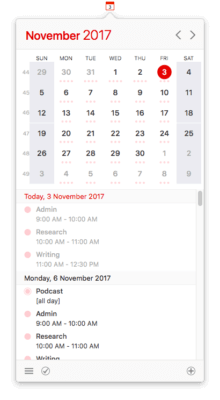 If iOS is your main port of call for managing your calendars, it can be difficult to justify the expense of the Mac app. Perhaps I’m being a little facetious. There are features on the desktop that some people will find indispensable. For my own, particular need the macOS app does not have five times the utility of two iOS apps put together. But for some users, the travel time alerts alone could be worth that. If you’re a student, you will likely have a similarly tricky time with the extra dime. Here is the good news. There is an alternative. 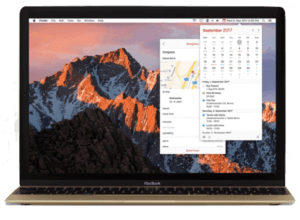 The developers of Calendar 366 have just released version two of their macOS app. It uses natural language parsing for data entry. It is not quite as mature as Fantastical, but it has more than enough for my needs. Between that, and menubar access, it is about all I need for a calendar. The fact that it ordinarily costs less than half the price of Fantastical is a pretty decent selling point, but you can cut that in half again if you pick it up during the launch of the new version. There is more than a little familiar about the dark theme, but that's not a charge I have to answer for personally. I'm trying to lighten up my workspace at the moment, I'm getting over the dark mode fad. Calendar 366 is half price on the Mac App Store at the moment. You can pick it up for US$10. The iOS version is universal, so you can pick up the the set for a steal.